The tough and sporty Power Shot D30 is the perfect choice for photographers and videographerswho wish to capture shots outdoors, underwater or at extreme climates. The Power Shot D30 can be submerged as deep as 82 feet, it makes an excellent companion in SCUBA diving and snorkeling. Bikers, hikers, skiers and climbers will also love to use the Power Shot D30 to document the day's action: the camera is shockproof to 6.5 feet, and temperature resistant all the way from 14 to 104F. The camera's new Sunlight LCD mode makes it easy to see the monitor on bright days photographing in tropical sun. 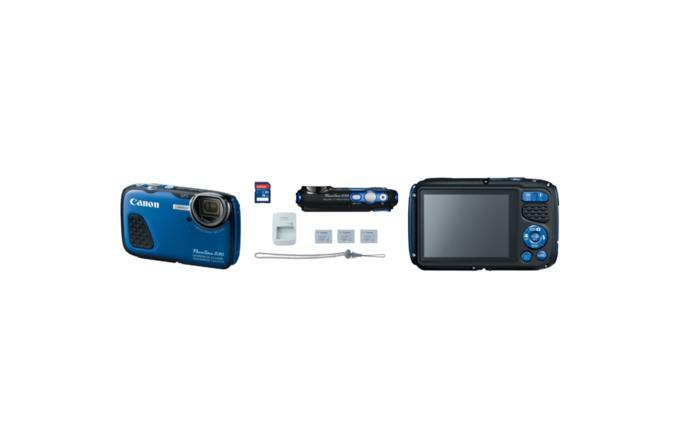 Whether you're underwater or on dry land, the Power Shot D30 produces images that are professional, steady, detailed, and vibrant thanks to the Canon HS SYSTEM and Intelligent IS. When you're too busy adventuring to choose camera settings, Smart AUTO does it for you by automatically recognizing 32 predefined shooting situations, capturing the best quality with every shot. Waikiki Camera can deliver anywhere in Waikiki such as your Hotel front desk or vacation rental. We have a courier service that goes out twice per day. Included is a FedEx label for easy returns. The package will come in a convenience travel case. Telephone and email technical support is available. You're going to have a great time with our GoPro HERO 4 rental. The package includes the following items with every rental. Contact us if you have any questions at hello@waikikicamera.com.